Decatur Highway Church of Christ is a place where people can meet Jesus, engage in life-giving community and everyone is welcome. We believe in creating a space where people can have authentic encounters with Christ, discover their gifts and use them for God's glory. Join us for our Sunday services! We do not claim to be a perfect church, but we are striving to be a church sound in doctrine, active in good works and united in the bond of peace. 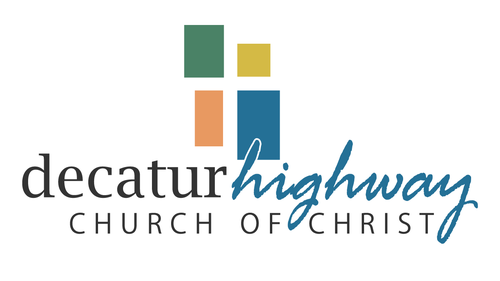 Decatur Highway is, first and foremost, committed to the Bible and a firm belief in its authority over our lives. We believe that we ought to teach what people in the first church were taught, believe what they were taught to believe and do what they were taught to do. Our worship assemblies consist of five expressions of worship: prayer (Acts 2:42), singing without the accompaniment of musical instruments (Ephesians 5:19), teaching (Acts 2:42, 20:7), communion each week (Acts 20:7) and giving (1 Corinthians 16:2). Worship is “corporate,” meaning everyone is encouraged to participate. A typical worship service will last about 60 minutes. We do not have a dress code. However, because it is worship to our God, you will want to be modest in your dress. Most people at our services wear their “best” to service, but “best” varies from person to person and all will be welcomed. Hearing devices are available for the hearing impaired (just ask an usher for assistance). Bring your Bible and an open heart. If you do not have a Bible, we will be happy to provide one.